Creating the right look to match the personality your business is trying to convey is something that’s extremely important when looking to create a certain impression. 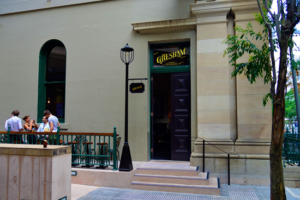 For the ambient old world bourbon and whiskey bar The Gresham Bar in Brisbane City, working with wrought iron was a material that helped them captured vintage appeal and old world charm and also complemented the impressive interior already used in the business. 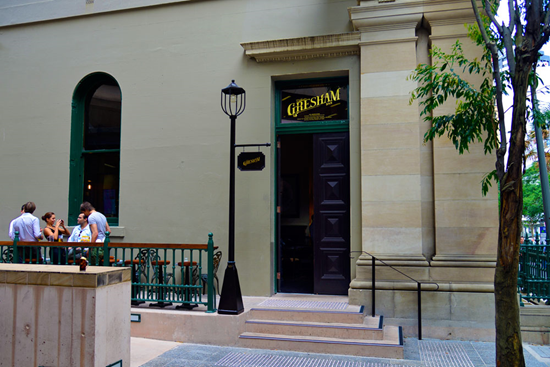 The team at Dean Wilson Iron recently completed adding our custom additions to this charming laneway watering hole, using the timeless appeal of wrought iron to add a touch of character to the welcoming heritage building in it set in, right in the heart of Brisbane CBD. Since its open the bar has received plenty of attention in the local press with many commenting on the design and the wrought iron outdoor area we were responsible for! Our exterior wrought iron work included a decorative moss green wrought iron railing which wrapped around the outdoor terrace. The other commercial wrought iron work we completed included the old fashioned gas lamp post at the entrance door and the hanging sign, bringing welcoming and nostalgic feel to the entranceway. Wrought Iron has the potential to be used in a commercial setting in a number of different ways. Here are just a few ideas to get you thinking about how you could use the timeless beauty of wrought iron in your business. Along storefront railings and entranceways. In other ways to create an upmarket and a nostalgic feel. If you have ideas about how you could harness the beauty of wrought iron to create a positive impression in your business, speak to the team at Dean Wilson Iron today.